https://zookaware.com/blog/wp-content/uploads/2014/05/2014-05-30-16_59_35-Microsoft-Security-Essentials.png 600 800 Tony Patarini https://zookaware.com/blog/wp-content/uploads/2017/01/zk_logo.png Tony Patarini2014-06-03 16:00:022016-11-15 07:47:46What is the Best AntiVirus for 2014? If you’re like most computer users, myself included, you’ve probably installed something on your computer unintentionally before. Maybe it was a browser toolbar. Maybe it was some other technically legitimate program that technically asked you if you wanted to install it, but worded the question in a really confusing way while still technically gaining your consent. Technically. 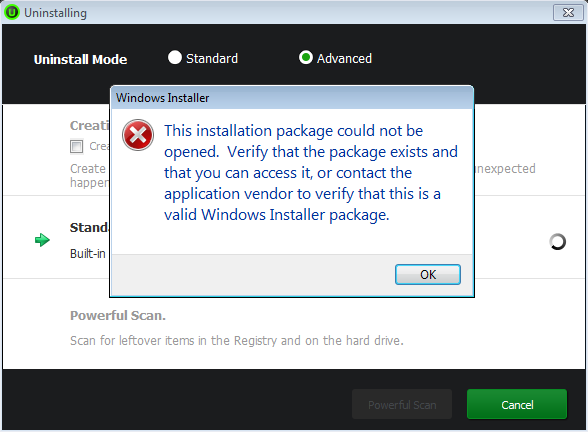 Or maybe you have a completely legitimate program that you just don’t want any more, but can’t remove it because the uninstaller isn’t working correctly. In my many trials and tribulations as a computer technician, I’ve run into both issues on many occasions. Normally resolving the issue involves a combination of guessing, praying, and banging my head on the keyboard repeatedly out of shear frustration. Fortunately, for you and for my forehead, those days are behind us. IOBit has created a program they call “Uninstaller 2” that has taken the hassle out of removing tough to remove programs. 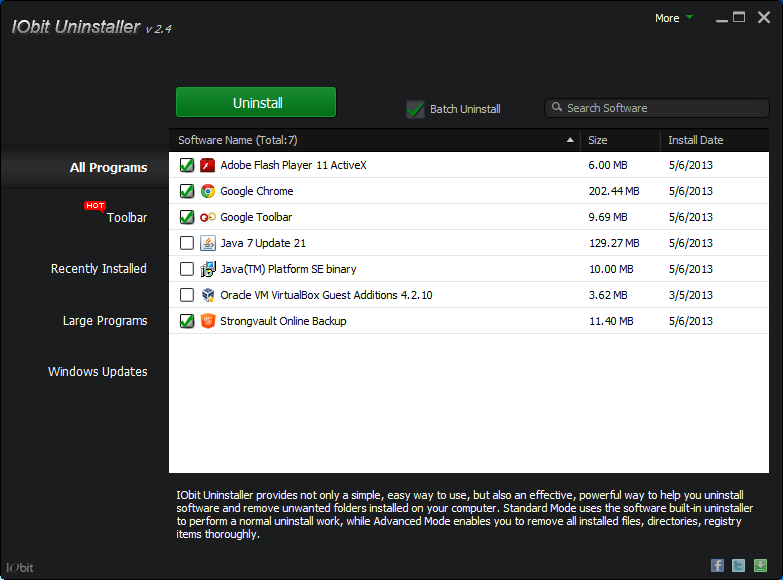 Uninstaller 2 takes the standard uninstall process up a notch by providing a “Batch Uninstall” feature. With Batch Uninstall enabled, you can select multiple programs that you’d like to remove at the same time, and Uninstaller 2 will automatically run the uninstallation process for each program one after the other. It sounds like a simple feature, but if you’ve ever had to remove a dozen or so programs at once, you can see how this can be a real time saver. To take advantage of Uninstaller 2’s most powerful features, make sure that you’re using the program in “Advanced” mode, which is the default. Even in the event that the uninstaller for the program is broken (intentionally or not) Uninstaller 2 can still take steps to remove the program from your system. 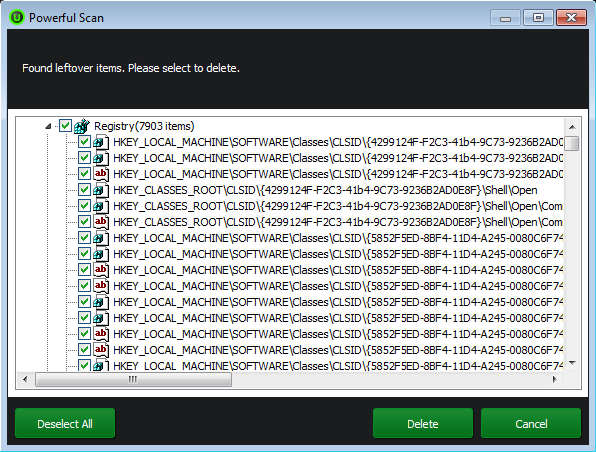 The “Powerful Scan” feature is where Uninstaller 2 really shines. 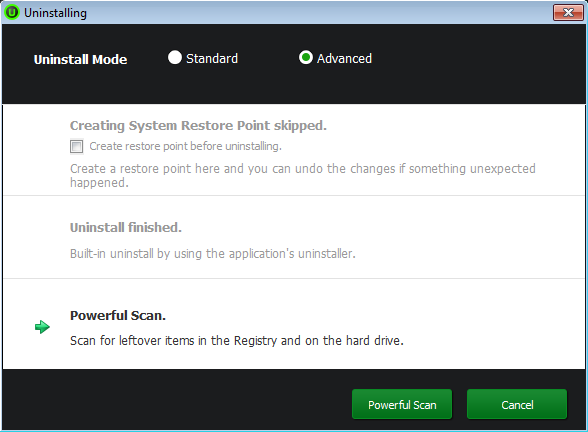 Powerful Scan will search your computer’s registry and Program Files for any remaining traces of the program that it just attempted to remove. You’d be surprised how often little bits and pieces are left behind by uninstallers. If any remnants are found, Uninstaller 2 allows you to choose which remaining items you’d like to delete, and removes them from your system for you. Uninstaller 2 can turn what once was a tedious several hour long procedure of tracking down software leftovers into a painless 2 minute process. While Uninstaller 2 won’t remove programs that deliberately infect your system for malicious purposes, like computer viruses or spyware, it can handle just about anything else.